There are many websites that suggest they are the best website for online degree research. But, most of these websites are owned by marketing firms that generate student leads for online programs. So the information they provide is limited only to the programs they support. Let’s look at the consequences for students who use these marketing websites for their online program research. I’ve been to many online degree “research” websites over the past few years. After I give my contact information in return for minimal online program details, I start getting phone calls and e-mails from recruiters who are interested in telling me more about their online program(s). While this is helpful for learning more about a few programs, it’s not useful if you want to really understand your best options from the universe of online programs available to you. 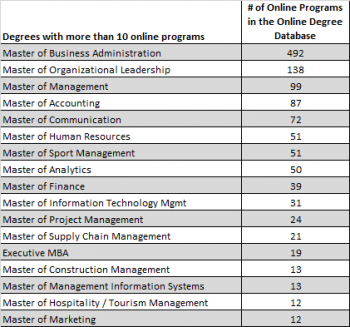 http://www.onlinemba.com/ returned seven online MBAs when I searched master’s degrees with Business Administration specialty. I got the university logo, online master’s program name, and a red box with the words “Request Info” to click. That was it. http://www.usnews.com/education/online-education/mba/rankings returned 282 online MBA programs, ranked according to U.S. News and World Report’s proprietary methodology (and includes 2015-2016 cost per credit and links to program and admissions websites). Everyone’s heard of U.S. News & World Report Rankings, but their rankings methodology is proprietary, so we can’t be sure that they are built on measures that are meaningful to students (and there are a few hundred online MBA programs that somehow didn’t make their list). http://www.topmanagementdegrees.com/rankings/affordable-online-mba-degree-programs/ provided a Top 50 Online MBA rankings 2018; a tool to search for MBAs requested that I enter my personal information before any details would be provided. https://www.guidetoonlineschools.com/ provides a limited number of details for only 54 accredited Online MBAs on their website. They say that these programs are a part of over 200 partner colleges with whom they have an advertising relationship. So, at least they qualify their listing with that statement. I would continue to review the dozen or so more websites out there just like these, but I think you get the point. There has never been a website designed by a marketing firm to generate leads for online programs that gives students the information they really need for online degree research to make the best decision and there never will be. It’s just that simple. The outcome of this proliferation of marketing websites designed to collect student leads has significant consequences for students, nicely summed up here: They don’t help students find their best fit school. They don’t provide better information to help students consider their options. They don’t promote a thoughtful deliberation process. And the cost of generating these student leads draws money away from Universities that could be used to improve the student experience, the academic programming, or even to reduce tuition or provide academic scholarships. The Online Degree Database has online program details for over 3,900 online degrees from more than 900 universities, collected from university websites by highly trained education experts. As shown in the table above, we provide students with details for 492 verified online MBA programs in the market today (along with the universe of other popular business sub-discipline degrees). So, other websites that offer seven options, 282 options, Top 50 rankings, or 54 options for online MBAs give researching students only a small fraction of all the possible information they need for online degree research. Check out our Interactive Search Tool today for the best online degree research outcomes possible. Get your FREE report that lists the programs that meet your most important criteria! Download as many free reports as you wish. Each report provides you with the name of the institution, degree name, and live link to the program website for the online programs that meet the criteria you select. Click on the program website links in the free report to continue your research directly with programs that fit your criteria. It’s easy, it’s free, and it is, simply put, the best website for online degree research. The Online Degree Database is the only independent and comprehensive source of information about online programs available in the market. We are not a marketing firm and we don’t require you to provide your personal contact information in return for program details. And we gather the details of all the most popular online degree programs in the United States so you can search by the criteria that’s right for you. You can find program details for online degrees in Nursing, Healthcare, Social Work, Education, Information Technology, and Public Administration on our website too. Once you’ve narrowed down your degree choices using the Online Degree Database, consider hiring an expert to help you make your final decision. Check out the innovative new consulting services offered by Clear Degree. They offer students like you professional, personalized assistance in finding the best degree program at a better price in less time, and can save you thousands of dollars in time and tuition. Universities, work with the Online Degree Database directly to access unique and relevant intelligence about the online degree market. And consider partnering with us to increase your visibility with students who are researching online programs. Contact Michelle at michelle@onlinedegreedatabase.com for more information.